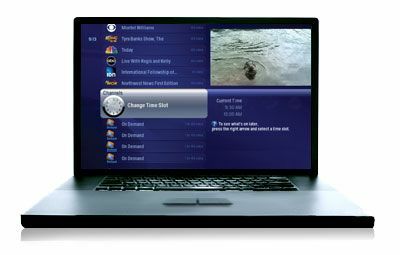 Unlike other PVR software applications which have traditionally targeted the technology enthusiast, Moxi TV for PC brings a more mainstream appeal to the category by applying best practices in TV navigation and design. With the popular Moxi Menu, users are able to intuitively explore two weeks of TV programming, watch live TV, schedule recordings and access other multimedia features including music, photos, and DVD viewing. Moxi TV for PC currently supports standard definition recording and works with an expanding list of tuner cards, including the most popular models used today. Current home theater PC enthusiasts, users of alternative PVR or DVR software applications and others who would enjoy more flexibility in where and when they watch TV are encouraged to participate in the Moxi TV for PC beta program. The Moxi TV for PC beta program will be available to a select group of participants for a limited time only, and candidates will be considered on a first come, first serve basis.